Which often signals the start of the Christmas shopping frenzy that culminates in January sales. 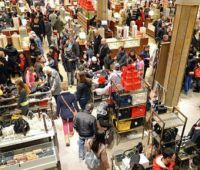 No longer restricted to electronic goods and expensive buys, Black Friday sales span the spectrum of products and services ranging from books to boats. For retailers, this event provides an opportunity to rake in the revenue, but without sufficient levels of preparation - it could end up costing a fortune. In the lead up to one of the most important shopping days in the calendar year, retailers should be considering the performance of their e-commerce platforms. It is best not to use the Black Friday event itself to load test an academically well architected online sales platform. Rather, a consistently updated and re-run stress testing solution is what will give retailers the confidence that their platforms are up to the job, reducing the risk of profit loss, brand damage and helping to keep up with evolving customer shopping behaviour. The power of retail analytics makes it easy to target promotional and campaign events to increase consumer spending. The operational underpinnings of the supply chain process can be better served by using detailed and accurate forecasting statistics that drive optimised inventory levels through better replenishment. This in turn guarantees improved on-shelf and/or standard availability, fewer lost sales and enhanced customer service. Black Friday presents the perfect opportunity for retailers to gain customer insights using business intelligence (BI) to achieve a competitive advantage. Whilst the tactics behind creating an event based around a spending frenzy, which injects an unnatural spike of sales in the demand forecast is understandable, the implications of failure can be profound. Carefully-recorded retail BI data collated over weeks, months and years can go to waste unless retailers harness and transform the analytics gained into actionable insight. This includes achieving a deep understanding into the buying habits of customers, frequency of purchase, location and catalysts. Retailers hold a large repository of customer data, which is at the core for delivering enhanced customer experiences. This information is painstakingly collected over months and years and can offer a better understanding of customers. Most retailers mine this data for marketing campaigns, loyalty offers, promotions and sales that include Black Friday deals. However, in order to keep one step ahead of the competition, retailers must capitalise on solutions that help with real time decision-making. Information sources today are not limited to traditional data stores. They include modern platforms such as social media, which vary not just in format and volume, but, more importantly, at the speed at which the data is produced. Therefore, this information should be made available in real time to utilise the information that increases sales for events such as Black Friday. Real time availability of information on ongoing sales through the retailer's own channels, as well as trends on social media can help retailers to personalise Black Friday deals in advance. More importantly, the ready availability of information can help retailers to amend or introduce new deals in real time, both centrally and locally, adding to the overall shopping experience. As D-day looms, some retailers might still be debating the pros and cons of participating in the upcoming discount day bonanza, as some fear this will cannibalise Christmas sales, lower margins and the like. Often seen as a shopper's delight, Black Friday can kickstart a retailer's revenue in the lead up to peak season, however, it can also be a retailer's nightmare if they are unprepared for the onslaught of shoppers that are on the lookout for a good deal.